You’re invited to dinner at Mami Aida’s! You’ll love your visit as she shares cooking tips and precious memories. 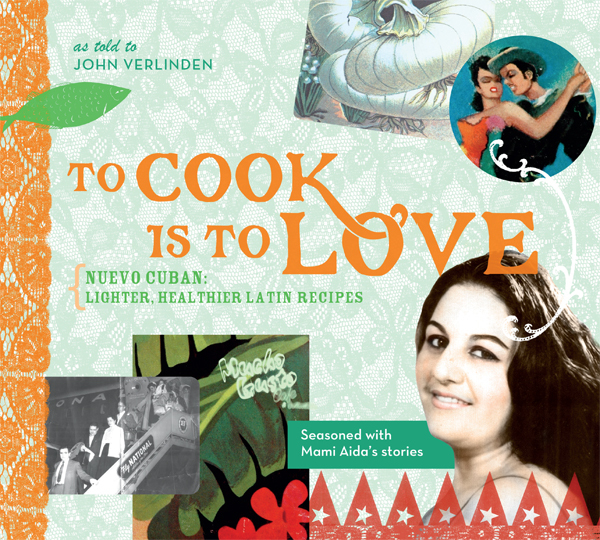 Interwoven with her inspiring story of faith, persistence and commitment to family are 200 of Chef Johnny’s Nuevo Cuban recipes. These healthier Latin dishes infuse gusto, soul, beauty and love into everyday meals. You won’t want to leave Mami Aida’s table until you’ve heard her entire story, and you’ll treasure this basic Latin cuisine resource for years to come. As a farm boy in rural Missouri, John never imagined that he’d grow up to be co-owner of Mucho Gusto Café & Collectibles or that he’d write To Cook is To Love, a basic Latin food cookbook. But, when he met Mami Aida, and tasted her food he was addicted. John has worked in food businesses for much of his life, and in every capacity from busboy, to waiter, to bartender to chef to owner. With Cuban food, he found a special connection. A food writer and educator, he created a healthy Latin cooking workshop for dieticians and trainers at Mass General Hospital, and developed a culinary arts program for inner city youth. His other passions also keep him busy -- consulting with small businesses, advocating for humanitarian, health & nutrition, social & political issues in his community, or working as a volunteer bringing friendship and material goods from the U.S. to the people of Cuba. John resides in Brookline, Massachusetts with his husband of 28 years. To Cook Is to Love is his first book.